A few months ago, one of the pilots here commented about his first time into Tamo, one of the airstrips where we often stop for fuel on the way out to the Sepik (the swampy lowlands in the northwest of PNG where the mighty Sepik River flows). He said, "There are no adults! Where are all the adults?" I really had never consciously noticed the lack of the elderly. A week or so later, I stopped through there to fill up the helicopter for the rest of the long trip to Ambunti. I looked around and noticed the same thing. The oldest people I could see were in their twenties or possibly early thirties. Any other place I stop, there are people of all ages around, but not here at Tamo. I asked one of the young men helping me put the fuel in, "Ol lapun we?" (where are all the old people?) He answered, simply, "Sanguma kilim ol." (The spirits killed them all.) He made no explanation or further comment. To say the least, the answer surprised me. I am well aware that virtually all Papua New Guineans are quite familiar with the spirit world, but the answer still caught me somewhat off guard. 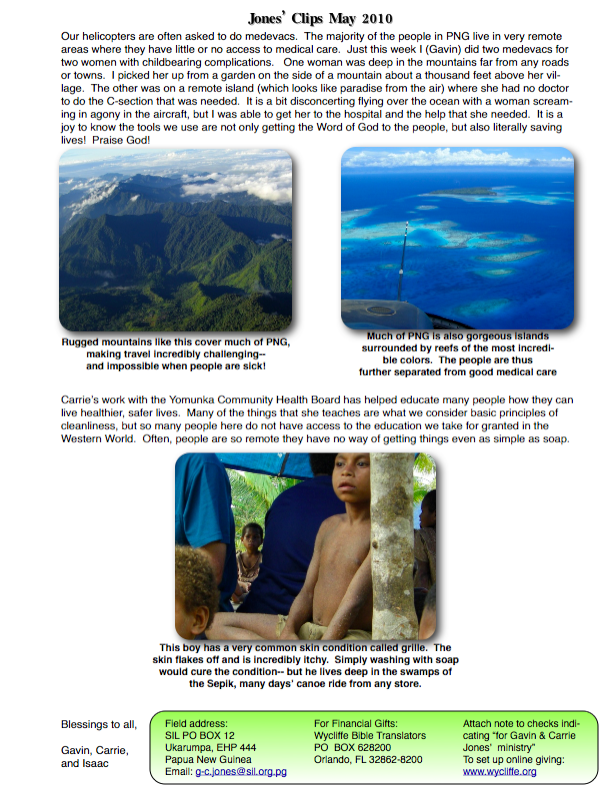 The people of PNG are predominantly animists, often living in fear of the spirits who are many times though to be dead ancestors and seeking to appease them in whatever ways they can. 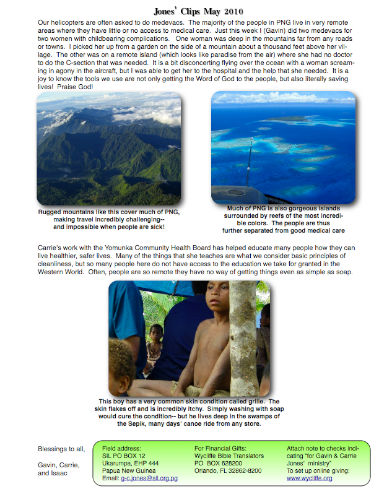 At the same time, the large majority of PNG is also evangelized. While many people know the Gospel and claim to know and serve Jesus Christ, they at the same time live still in fear of the spirits and what they can do. Sorcery is still alive and well here. People have spells cast on them by enemies and often deaths or sickness are attributed to sorcery. Though this may be true in some cases, for the most part, the sicknesses or deaths are due to natural causes. All this is to say, the Devil is alive and well here, prowling around like a roaring lion, seeking who he may devour with his lies and deceit. Pray for God's grace and truth to prevail in the lives of these people, that they may know His freedom from fear and the joy of His salvation! The picture was taken shortly after leaving Tamo. That is the Sepik River-- the highest it has been in 30 years-- there has been LOTS of rain here this wet season. In fact, we had one night about a month ago when it rained 7 inches overnight. Here is our first edition of Jones' Clips, what we plan to be our monthly email update. I'm also planning on posting some of our past newsletters, so those who want to catch up on what's been going on with us for the past few years can do so.